You’re in for the adventure of a lifetime when you go ziplining in Oahu! When you visit us here at CLIMB Works Keana Farms, we’ll make sure your experience is nothing short of amazing! To help you plan for your trip, here are 5 things to know before you arrive. If you’re bringing kids, keep in mind that they have to be at least 7 years old to participate. If they meet this age requirement but are under 85 lbs, they can still join in, but they may be required to ride tandem with a guide or another lightweight sibling. Participants under 18 years old must be at least 15 years old to zipline without an adult. You must also weigh under 270 lbs, and be in good enough health that you can stand on your feet for 3 hours, and comfortably walk half a mile on even terrain. If you’ve recently been injured or had a surgery, we strongly discourage participation for your own well being. You’ll start the tour off with a 10-minute, 2-mile ATV ride by farms, through the jungle and up to the top of the mountain. 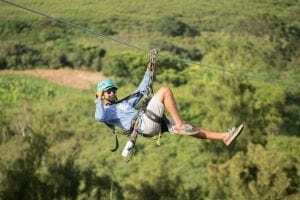 Our 3-hour zipline tours are the longest in Oahu ranging from 500 feet to nearly half a mile long! You can enjoy scenic views of the North Shore’s famous beaches, farms, and lush mountains with friends and family right next to you on one of our 8 side-by-side zipline runs. Along your tour, you’ll encounter 2 rappels, 3 sky bridges, scenic boardwalks, and other exciting surprises! It’s important to bring all the things you’ll need and to dress appropriately for the weather in comfortable clothes. Rain in Hawaii can come and go very quickly so it’s a good idea to wear clothes that you don’t mind getting a little wet. Short shorts, dresses, skirts, swimsuits, and baggy clothes are not recommended. Glasses and sunglasses may be worn, but if you plan on taking them off, be sure to bring a strap so that you don’t lose them. Dangling jewelry and any other unsecured items are also not allowed for the safety of those working or traveling under our zip lines and platforms. Reservations made at least 5 days in advance are strongly encouraged to ensure you reserve your preferred time. You can either call to make your reservation or book online. Whether you’re visiting with a wedding party, corporate group or for a family reunion, our ziplining tours are great for all occasions. As an added bonus, groups of 10 or more will automatically get 10% off. If you find that you need to cancel, you can do so 48 hours before your scheduled tour and receive a full refund or we will reschedule your visit. No refunds will be given for cancellations under 48 hours. 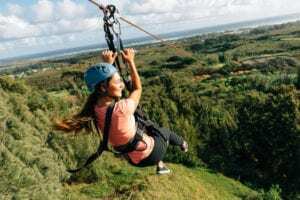 Now that you know a little more about what to expect when you go ziplining in Oahu, it’s time to start planning your trip! If you have any other questions, check out our FAQ page to get them answered before your adventure.